In a push for citizens to install greywater irrigation systems in their homes, the SFPUC (city water department) has launched a program to offset the cost of materials for qualifying households. The so-called Laundry-to-Landscape program requires a formal application with proof that the property has a working washing machine and a yard that is level or downsloping away from the machine's outflow. The first 150 qualifying households will receive a 95% subsidy toward the purchase of a hardware kit (hub connectors, three-way valves, etc.) 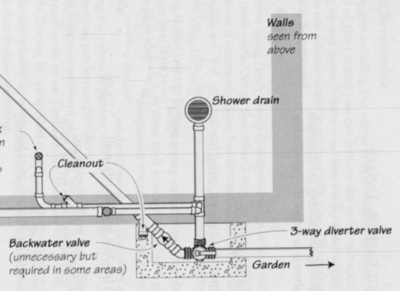 to divert greywater from the sewers and use it to irrigate the garden. Only 1- or 2-unit residential buildings are eligible, and only these buildings are allowed to install greywater systems without a permit from the building department. To encourage and promote the use of graywater systems in larger and/or commercial or industrial buildings, the SFPUC also offers a rebate up to $225 toward the cost of obtaining a permit. To be eligible, the graywater system must be used for subsurface irrigation only. For more information on the program, check the SFPUC's dedicated greywater page. For help with the application and permitting process, or to order a professional greywater design for your property, contact Madroño.